SAN FRANCISCO—Location, location, location. It’s not just important for real estate but also for public cloud performance. That’s the conclusion of a recently published Public Cloud Performance Benchmark Report from network monitoring firm ThousandEyes. Imagine you’re building out an internationally-based enterprise IoT project that will leverage infrastructure from one of the top three public cloud providers: Amazon Web Services, Microsoft Azure and Google Cloud Platform and you would like to spread computing across multiple regions. Although it is difficult to crown any of the big three as a winner (or loser) in terms of network reliability, the report finds clear differences in performances in specific regions. For instance, Europe-based GCP users who need to send data to Mumbai must contend with three times the latency compared to the other two options. That delay is a result of the circuitous route GCP uses to send traffic from continental Europe to the United Kingdom and finally to a backbone in the United States before it reaches India. GCP also has roughly three times as much latency when linking Mumbai and Europe. 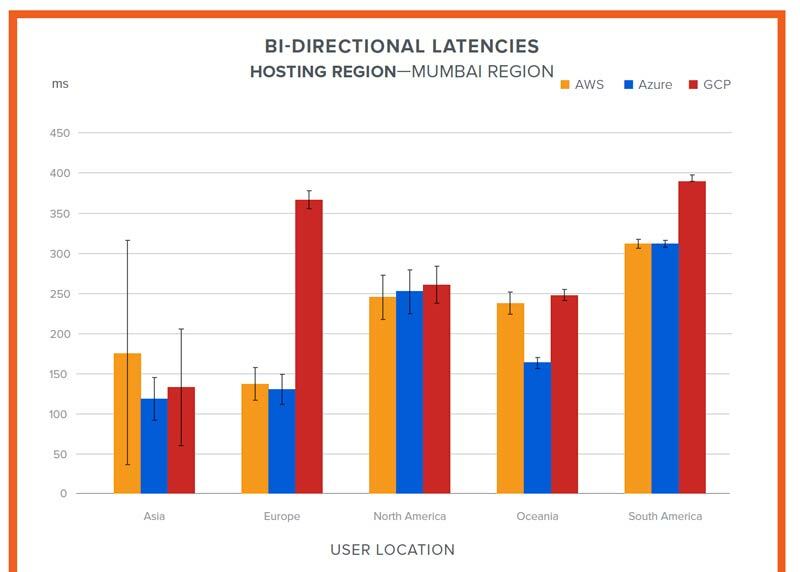 But if you plan to use Microsoft Azure in Brazil, the bidirectional latency you encounter will be four times slower than AWS and nearly eight times slower than GCP. Conversely, if your public cloud use is based in Europe or North America, AWS, Azure and GCP have broadly similar network performance. Apart from these regional differences, one of the most significant findings from the ThousandEyes study is that AWS is more prone to performance-related problems. That’s because the Amazon service routes traffic through the internet, which is generally more volatile. “AWS loves the internet, but the internet doesn’t love AWS back,” quipped report author Archana Kesavan, senior product marketing manager at ThousandEyes. This fact also tends to make AWS performance suffer in world regions with poor internet connectivity. That can be problematic in Asia, for instance, where internet fiber routes are less common than in, say, Europe or North America. AWS is thus 30 percent less stable in Asia than the other two providers, which ingest user traffic closer to the user location. Although the ThousandEyes report stopped short in declaring a winner among the three cloud providers in its report, Azure tended to fare best overall in terms of reliability. The report also revealed that the three companies use provider backbone networks for traffic passing from one cloud provider to another. A growing number of companies rely on multi-cloud arrangements with some doing so unknowingly. For instance, an enterprise using Azure and Slack would rely on cloud connectivity from two providers, since Slack is hosted on AWS. The connectivity among the three public cloud providers bodes well for such arrangements. For now, ThousandEyes counsels that organizations planning to leverage public cloud connectivity should take into consideration regional performance data while evaluating a multi-cloud strategy to compensate for sub-optimal performance from an organization’s central provider. The company also recommends that organizations gather ongoing performance data. Ultimately, the cloud is constantly evolving and it is entirely possible that, next year, the performance of the big three will vary considerably. ThousandEyes is already planning a sequel to this report next year. Nokia announces separate partnerships with AWS and Bosch to enable IIoT use cases by supporting edge computing, productizing software and services for predictive maintenance and more. IoTWorldToday.com: The same great content as before, now more closely aligned with the Internet of Things World event series.